Mrs Noor Jahan Ali BEM, Senior Buying Manager World Foods, at Morrison Supermarkets Plc. received a British Empire Medal for services to Diversity in the Retail Industry. Noor is passionate about Morrisons’ heritage and has being at the heart of the local communities it serves by supporting key cultural events and festivals. She ensures that Morrisons has an excellent offering and runs in-store promotional events including for Ramadan and Eids, Hanukah, St Patricks Day, Passover, Carnival Season, and Diwali . Noor’s role is all about delivering products and services for her customers. Getting the right products, in the right stores at the right price! This involves listening to customers and store colleagues, working in partnership with our suppliers and with many internal categories, and also understanding the market trends both now and in the future to drive innovation. In 1992, Noor joined her brother to open a modern ethnic supermarket in Bradford where she was responsible for ordering products, pricing, training colleagues and customer service. They went on to successfully sell the family business. This gave her the skills to work for the larger retailers beginning with Asda in 2001 where she began as a checkout operator. Within six months Noor was promoted to Head Office as People Advisor in HR, then roles in Marketing, Merchandising, eventually in Trading where Noor became an Ethnic Buyer for World Foods. In 2007 Noor launched 1,200 new lines into the business – a first for world foods within the top retailers. Over the five years Noor successfully grew the world foods category by over 300%, a huge success for Asda. In 2012 Noor joined Morrisons as World Foods Manager and was promoted to Senior Buying Manager in 2014. Noor partnered with 85 suppliers to grow the category from just 500 lines to over 1350 and increased year on year sales by 146%. On a personal note, Noor thoroughly enjoys sharing her culture, knowledge and experience. She has a strong passion to coach and develop both individuals and businesses, mentoring and supporting them to achieve their goals. Though her BEM is an acknowledgement of what she has done for retailers in growing their ethnic foods market, as she was also Race for Opportunity Mentor Leader – as part of the Race to the Top mentoring programme for BAME Women which supports women from both private and public sector organisations. Noor is currently Vice Chair and a Lead Mentor for the Yorkshire Regional Mosaic Group – mentoring young students and mentoring as part of the Business Enterprise Challenge through coaching and motivating students. She has won several awards including – Yorkshire Asian Business Association Professional of the Year in 2016, Everywoman Retail Ambassadors Award 2014, and Business Woman of the Year 2011 at the Asian Women of Achievement Awards. Also category awards include – Winner of the Race for Opportunity Awards 2007, 2008 and 2010 for Supply Chain Diversity, Winner of the World Foods Awards 2009 and 2010 Best Retailer Award and was highly commended at the World Food Awards 2013. 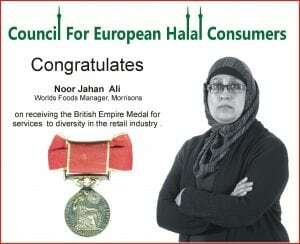 HalalFocus would like to congratulate Noor Jehan BEM for the example she has set with her work in developing the ethnic foods sections in two of the UK’s largest supermarket and also for the contribution she has made to the Asian business community in the UK. « Opinion: Are Halal free trade zones on the horizon for UK post-Brexit?